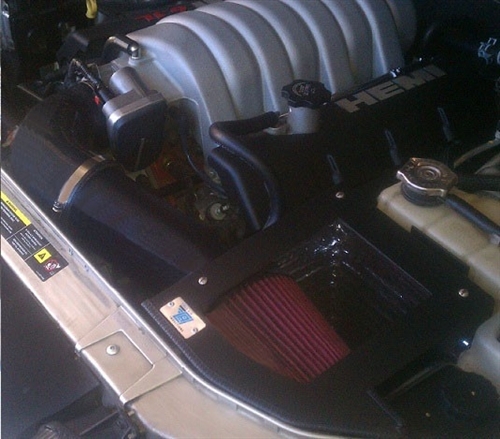 Boost your Mopar's performance with our true cold air intake. Our intake system surpass our competitors with superior quality and craftsmanship while achieving outstanding performance gains. We see on average, a 15 horsepower gain on otherwise stock 6.1L's Intake System Includes: - Aluminum Insulated Air Box - Air Box lid with 1/4 turn fasteners - 4" Ceramic Coated Intake Tube - CAI, Inc. Cone Filter - Black Silicone Couplers - Installation instructions. Fits 5.7L and 6.1L LX and LC bodies. We changed the design on the coupler. Some minor changes were made to the box as well. These changes allowed us to see an average gain of 3 RWHP over the previous design which puts the system at creating an average of 16 RWHP, which we are very happy with.